Philip David Charles "Phil" Collins (born 30 January 1951) is an English drummer, songwriter, actor and singer. He was born in Chiswick, Hounslow, Middlesex. He was the drummer and singer of the band Genesis. He is very well known for his career away from the band, as a solo artist. His most well known album is No Jacket Required, which has sold over ten million copies in the United States. One of his most well known songs is "In the Air Tonight", which had a long running false rumour that it was about a drowning that Collins had witnessed. Collins starred in the movie Buster (1988). His daughter Lily Collins is a famous actress. Collins won the Academy Award for Best Original Song and the Golden Globe Award for Best Original Song for "You'll Be in My Heart". That song was in the movie Tarzan. ↑ "Not one more night: Singer Phil Collins announces his retirement". Dailymail.co.uk. Retrieved 5 June 2012. ↑ 3.0 3.1 3.2 3.3 3.4 3.5 3.6 3.7 "Collins, Phil 1951–." Contemporary Theatre, Film and Television. 2005. Encyclopedia.com. 26 Dec. 2014 <http://www.encyclopedia.com>. 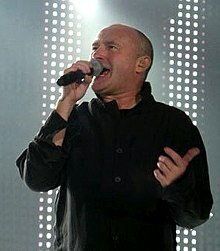 Wikimedia Commons has media related to Phil Collins. This page was last changed on 29 January 2019, at 01:04.